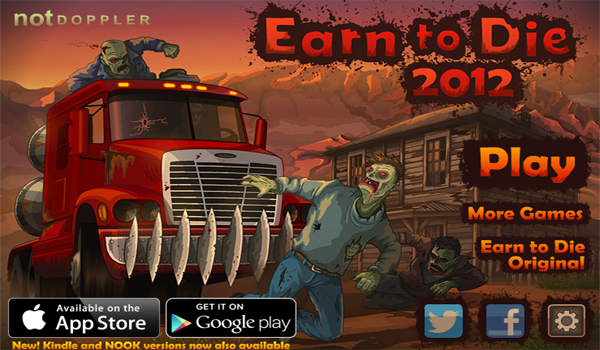 Earn Die To Die 2012 is a very simple game that has you driving through levels and earning money in order to buy upgrades that allow you to drive further in aforementioned levels (also, these levels have zombies in them, go figure). It’s a fun time killer, but there’s only so much a guy can write about when describing this game. Instead, I want to break down the 30 second or so intro that brings the player up to speed on the plot of Earn To Die 2012. In the first scene, we see a weathered helicopter making its way through a desert. Seems innocent enough outside of the fact that the vehicle doesn’t really look air worthy. Once the camera pans down, we see that there’s more to the story as a zombie is hanging onto the rungs of the helicopter. This is definitely a dangerous situation for the pilot, but the camera pans down again and you realize that there’s another zombie latched onto the foot of the first zombie. As far as I was concerned, the pilot was screwed at this point, but then the camera pans down again and there’s a THIRD ZOMBIE hanging on to the second zombie’s foot. WTF! The pilot’s family (assuming they’re still alive, which they’re probably not) might as well schedule a funeral cause he’s toast. The next scene shows that the helicopter has landed safely as for one reason or another, all of the zombies’ legs fell off during flight, rendering them incapable of pursuing their host. 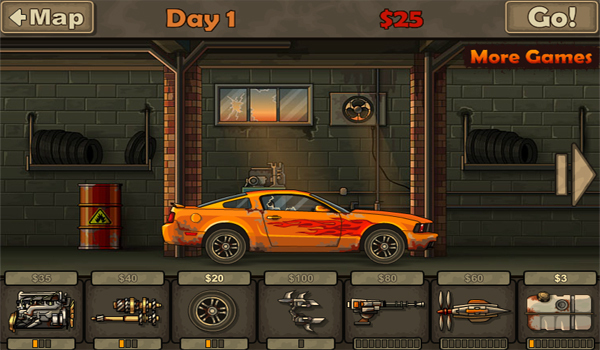 The pilot, a rugged fellow with sunglasses and a devil-may-care attitude, moves on without considering how close he was to death and jumps behind the wheel of a muscle car on his way to freedom. Not only was this awesome, it was also really inspiring and made me rethink my plan for the rest of the day that consisted of drinking the rest of my chocolate milk and crawling back into bed. I finished the milk, but bed can wait.